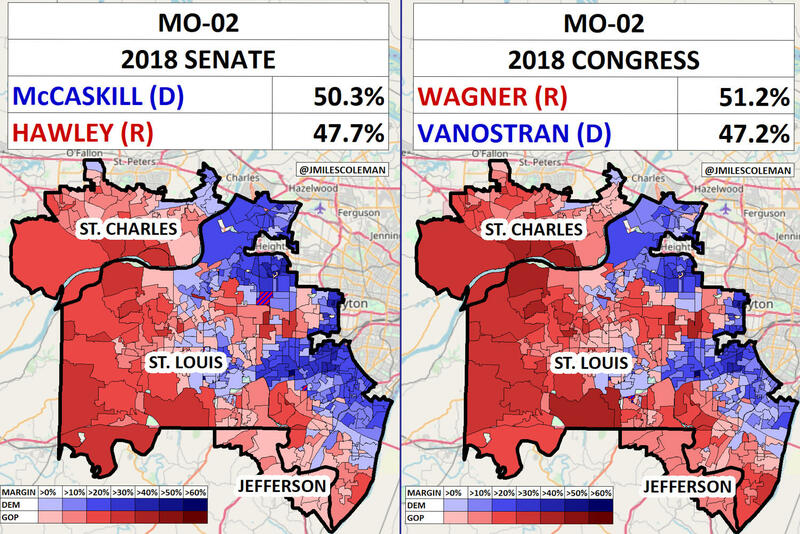 U.S. Rep. Ann Wagner, R-Ballwin, won her 2018 race against challenger Cort VanOstran but her suburban St. Louis district has been sliding increasingly Democratic in recent elections. U.S. Rep. Ann Wagner sees herself as a survivor who’s out to warn fellow Republicans from the suburbs that they are an endangered species – and face potential extinction in 2020 – unless the national party changes course. By all accounts, the suburban “blue wave’’ last November swept the Democrats into control in the U.S. House. “Obviously, there’s no mystery, no question. We lost a lot of Republican seats in suburban districts,” said Wagner, R-Ballwin. She won a fourth term by four percentage points, and believes she’s among the few Republicans nationally who represent solely suburban districts and were re-elected. Missouri Republicans did well statewide, largely because of the GOP’s rising rural support. But Republican consultant John Hancock, a former chairman of the state party, warns that a suburban shift to Democrats is a long-term threat. “You can’t continue to have erosion of voter support and continue to win the way we’ve been winning,’’ Hancock said. Which is why Wagner is pressing to resurrect the national GOP’s Suburban Caucus — dormant for a decade — that she says could be part of a broader effort to attract suburban voters back into the GOP fold. “We need to come up with an agenda that is actually going to improve the quality of lives in suburban areas with suburban families,’’ she said. Such an agenda would include “kitchen-table issues,’’ such as promoting paid family leave, flexible work schedules and boosting the tax-free amounts that people could put into special accounts – flexible savings accounts and health savings accounts – to cover medical costs and childcare. Although such proposals may sound more like a Democratic agenda, Wagner says her ideas fit in with the traditional Republican focus on lower taxes and fewer regulations. Cort VanOstran, the Democrat who narrowly lost to Wagner, noted that his campaign message included many of those same proposals. The 2nd District was crafted by the GOP in 2011 as a reliable Republican seat. It spans from northern Jefferson County through much of south and west St. Louis County into south St. Charles County. Wagner contends that she won re-election because she focused on her record and avoided talking about her Democratic opponent or President Donald Trump. “We did not nationalize this race,” Wagner said, noting that wasn’t the case in Missouri’s closely watched U.S. Senate race, where Republican Josh Hawley promoted his Trump ties in his successful campaign to oust Democratic incumbent Claire McCaskill. In Wagner’s case, keeping her distance may have helped her win. Hawley’s message wasn’t so popular in the 2nd District, which saw a 17-point swing in favor of Democrats, compared to 2016. Democrat VanOstran came within 15,000 votes of ousting Wagner, who has represented Missouri’s 2nd District since her first victory in 2012. VanOstran, who attracted large crowds, said 2nd District voters were receptive to his message "about good government, real answers on health care and gun safety." Wagner notes that voter turnout in the 2nd also was up almost 50 percent over the last mid-term election in 2014. And she gives the credit largely to McCaskill’s campaign operation. Democrat Claire McCaskill's victory in the 2nd District sends a signal that the GOP message that won rural Missouri is not playing well in the suburbs. Republican Josh Hawley carried the state. A majority of the 2nd District’s voters favored McCaskill for the U.S. Senate and Nicole Galloway for state auditor. McCaskill outpolled Hawley in the 2nd by almost 10,000 votes, or almost three percentage points. David Kimball, a political science professor at the University of Missouri-St. Louis, says it has gone almost unnoticed that McCaskill collected about 12,000 more votes in the 2nd than VanOstran, who has been touted as a trendsetter by progressive Missouri Democrats. McCaskill says simply that there’s no question the 2nd District is reflecting the national suburban trend. “There’s a real change in a lot of the suburbs in America about who should be in charge,” she said. Many Missouri Republicans prefer to focus on their huge gains in outstate Missouri, especially in the southeast portion of the state. Areas like New Madrid and the Bootheel were once reliably Democratic. In October 2000, then-Gov. Mel Carnahan – the Democratic nominee for the U.S. Senate – was enroute to a rally in New Madrid when his plane crashed, killing all on board. But now, southeast Missouri is the reddest part of the state. The 8th Congressional District, which spans from southern Jefferson County to the Bootheel, went overwhelmingly for Hawley, who captured close to 70 percent of the vote. The district’s strong Republican leaning is a key reason why Trump held his election-eve rally in Cape Girardeau, which is in the 8th. Looking ahead, Kimball says Missouri’s strong rural attachment to the GOP is bad news for Democrats, especially in 2020. “Going forward, it’s an uphill battle for Democrats to win a statewide race in Missouri,” he said. U.S. Reps. Mike Bost and Ann Wagner bucked a national trend to survive tough Democratic challenges Tuesday. The two Republicans will return to a House that Democrats control after the GOP lost a number of other seats across the country. Congresswoman Ann Wagner joins Politically Speaking once again to talk about her re-election bid in Missouri’s 2nd Congressional District. The Ballwin Republican was first elected to represent the 2nd District in 2012. It encompasses parts of St. Louis, St. Charles and Jefferson counties.